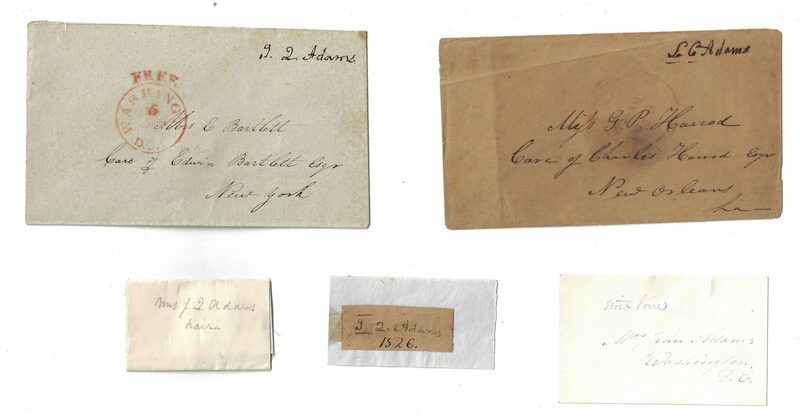 Archive of five (5) items related to President John Quincy Adams and Louisa Adams. 1st item: John Quincy Adams cut signature as 6th President of the United States, dated 1826 in darker ink. Mounted to 1 5/8" H x 2 3/4" W piece of light blue paper. 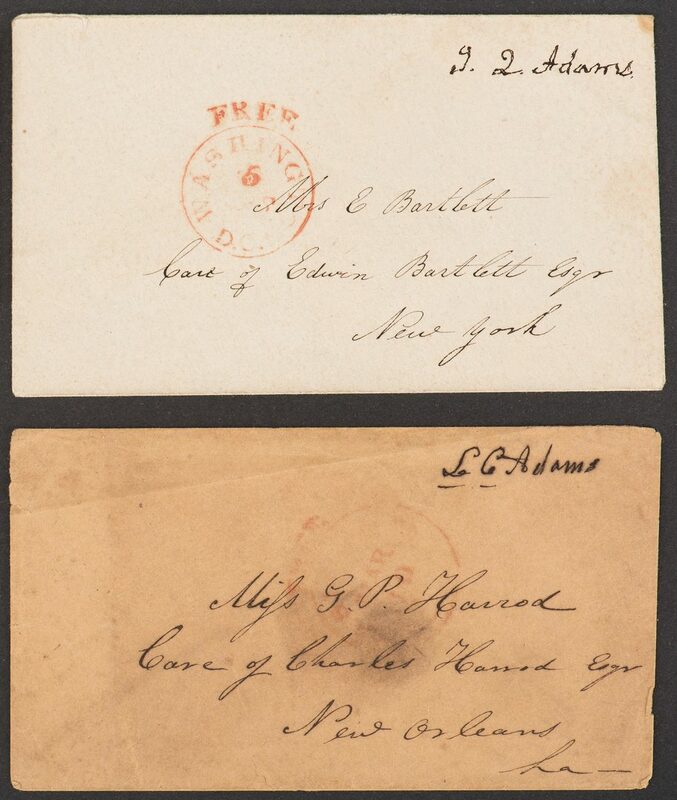 Cut Signature – 7 7/8" H x 1 7/8" W. 2nd item: John Quincy Adams undated free franked envelope addressed to "Mrs. E Bartlett, Care of Edwin Barlett Esqr New York" with red postmark stamp from Washington, D.C. Address in writing probably by a secretary or local postmaster. 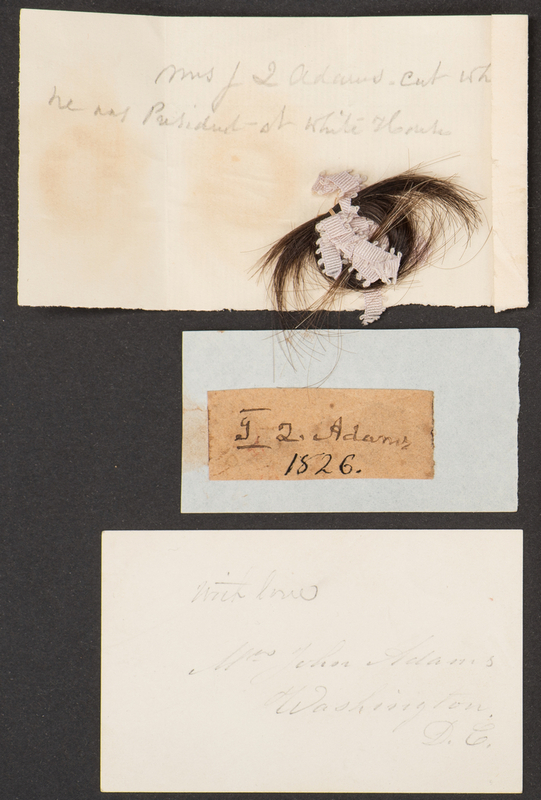 Intact black seal with the image of a rooster and "Watch", en verso. 3 1/2" H x 5 3/4" W. Note: Edwin Bartlett (1796-1867) was married to Caroline Harrod, Elizabeth Coombs Adams' (1808-1903) first cousin. Caroline's father, Joseph, was a brother-in-law of Thomas Boylston Adams, the youngest child of John and Abigail Adams. Barlett was a business man and was appointed U.S. Consul at Lima, Peru from January 1838 to February 1840. 3rd item: Louisa Catherine Johnson Adams (1775-1852) undated free franked envelope addressed to "Mi[s]s G. P. Harrod Care of Charles Harrod Esqr New Orleans LA" with faded red postmark stamp. Address in writing probably by a secretary or local postmaster. 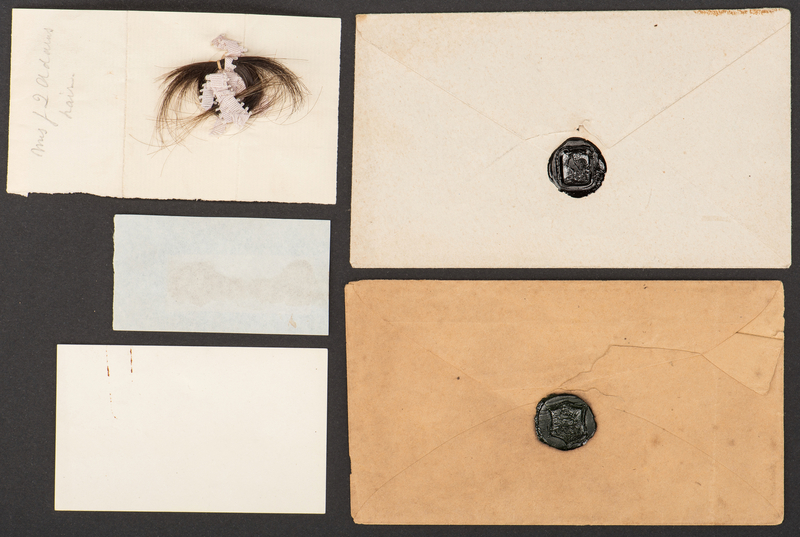 Intact black seal with the image of a horse and the initials "CCA", en verso. 3 1/4" H x 5 3/4" W. Note: Charles Harrod (1787-1870) married his first wife Hannah Rolf Dayton (1793-1825) daughter of General Elias Dayton of New Jersey, on March 7, 1811. He was a business man, a president of the Atchafalaya Bank, and an Aide to General Andrew Jackson during the Battle of New Orleans, January 8, 1815. G.P. likely refers to their daughter, Georgina Patterson Harrod. 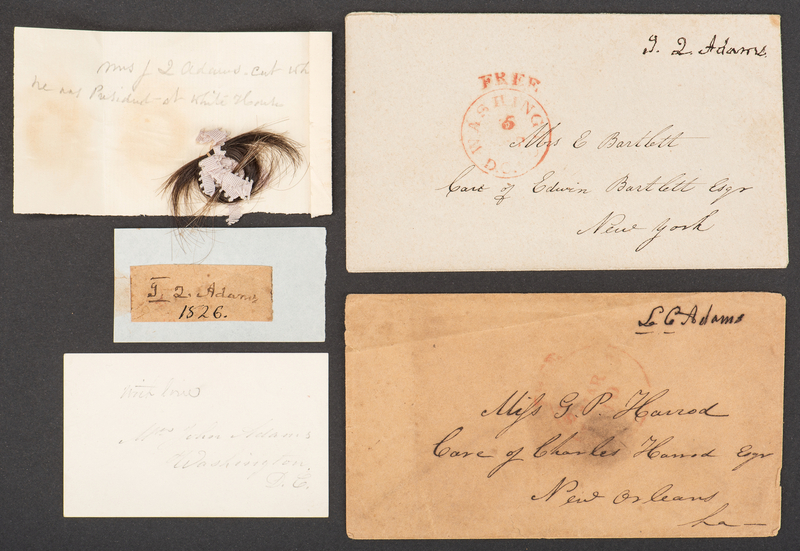 4th item: Lock of brown hair secured by white thread and tied in a light blue grosgrain ribbon. Lock is folded in a piece of paper reading "Mrs J Q Adams hair" with interior notation reading "Mrs J Q Adams–cut when he was President–at White House". Lock approx. 1" H x 2" W. 5th item: Calling card with pencil notation reading "With love Mrs John Adams Washington D.C.". Writing does not appear to be in Louisa's hand, possibly written by a secretary. 2 1/4" H x 3 5/8" W. Provenance: The Estate of Charles Boyd Coleman, Jr., Chattanooga, TN. Descended in his family from Charles Harrod Boyd, grandson of Charles Harrod (1787-1870). Charles Harrod was the brother of Ann (Anna) Frances Harrod Adams (wife of Thomas Boylston Adams, 1772-1832, the son of President John Adams). Note: Charles H. Boyd's wife, Annette Maria Dearborn Boyd, was the daughter of Greenleaf Dearborn (1786-1846) and great granddaughter of Maj. General Henry Dearborn (1751-1829) on her mother's side. She and Charles Harrod Boyd had four children, including Julia Wingate Boyd, who married Lewis M. Coleman, Jr., Chattanooga, TN, a direct descendant of John Marshall (1755-1835). John Marshall was the Fourth Chief Justice of the United States and also served as Secretary of State under John Adams (1800-1801). CONDITION: 1st item: Overall good condition. Signature in generally strong, clear condition, last few letters of "Adams" slightly faded. 2nd item: Overall good condition with minute foxing spots. Adams signature in strong, clear condition. Seal intact. 3rd item: Overall good condition with areas of minute foxing and dampstaining. Louisa's signature slightly smudged by dampstaining, otherwise in strong, clear condition. 4th item: Overall good condition. 5th item: Overall good condition. Pencil writing slightly smudged/faded. 1 1/8" rust stain from paper clip visible en verso.